Russian President Vladimir Putin is basically shrugging in the general direction of both the United States and NSA leaker Edward Snowden, while attempting to still say all the right things. Following Snowden’s official application for asylum in Russia, Putin once again stated that Snowden should refrain from “activity that harms Russian-American relations,” but stressed today that it’s a relatively minor issue, all things considered: “Bilateral relations, in my opinion, are much more important than the squabbles around the activities of the security services,” he said. As for Snowden, who knows! “He’s a young man,” said Putin. “In fact, I do not even really understand how he intends to continue to build his life. But it was his destiny and his choice. And we have our own national objectives.” So, that’s a maybe? 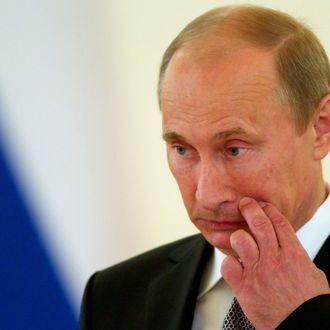 Putin, too, seemed to hint that this asylum thing will work out eventually. “Russia has an independent foreign policy,” he said, “and we will implement it. I hope that our partners understand and react to this with calm, understanding.” Barack Obama is due to visit Russia in September, so we’ll see.